A quick look at the game and its theme. The island has different ideas. Each turn the island is starting to sink back beneath the ocean waves, dragging it’s secrets back to the ocean floor. Unfortunately, you are already on the island. You’re going to have a very eventful day. 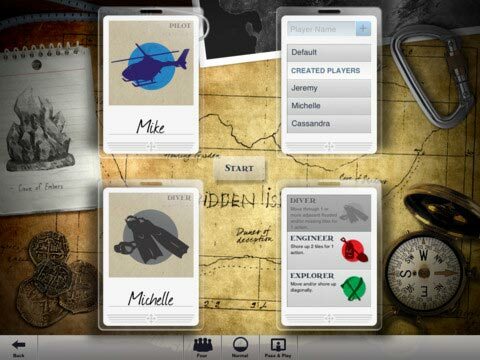 The iPad version of Forbidden Island does instruction right: even if you don’t go through the tutorial game (which is very informative, btw) the game itself still guides you through the steps you need to complete the mechanics of the game. Whoever thought of this way of guiding the game deserves a hug. But all I can do is give him or her my hard earned cash. You start off with two tile configurations for the island, and for $1 more there’s an in game purchase for 10 other island tile configurations. I love the idea of losing with new and exciting tile configurations. I parted with another buck for the new configurations, although the more difficult configs will not help my chances of winning. I love supporting great games, and this is one of those. Buy it. This game has a multiplayer component for pass-and-play, and another for up to four people to sit around an iPad and play – but for me it’s the availability for solo play. 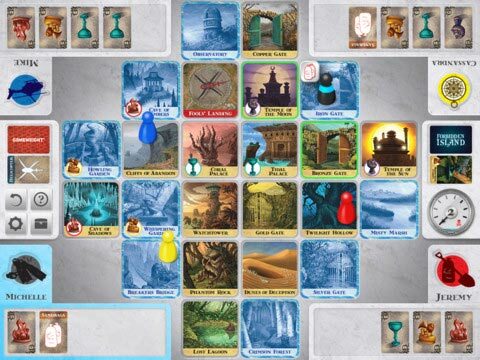 On a sleepless night at 4am (more likely scenario), or with my pals at the local coffee monger (the less likely scenario), Forbidden Island for the iPad is a real winner. Even though you won’t win, because this island is sinking. Fast. *Handy tutorials and swift interface ensure gameplay is rapid and smooth. *Solid price point for a game with good replay value. A wordy opinion:Forbidden Island is a co-op game that entices you and three others to visit its shores with the promise of four colourful ancient artifacts. What the brochure doesn’t tell you, is that all it takes is the weight of at least two intrepid explorers to force the entirety of the mainland to slowly sink. Then again, this probably should’ve been apparent when browsing for travel insurance. Nevertheless, the intrepid among you must battle through the islands glorious locales in a bid to collect all of these precious artifacts before they get wet…and dissolve. The digital edition retains the stress, drama and a few foibles of the original, but puts them forth in a tidier, cheaper, more commuter friendly form. In the race to discover four artifacts, players take three actions ranging from moving around the island itself, to shoring up tiles and gifting items to other players. Every turn they’ll pluck up two adventure cards that show a particular artifact. 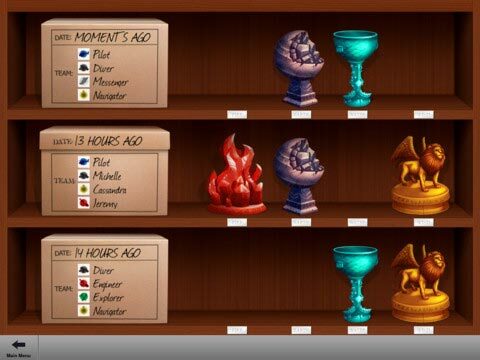 Once someone has gathered four cards that show the same artifact, they can trade them in for a funky little trophy that can be gained at specific locations. Gather four and they can escape the island with grand forms of wealth. Forbidden Island follows a rather traditional form of cooperation seen in Pandemic. It’s a welcome likeness, I mean, it’s only one of the most glorious teamwork based games of all time, but the foe in Forbidden Island comes from a greater environmental danger; the island itself. As turns go by, flood cards reveal sections of the island that become submerged in water. If a location is drawn that’s already coated in wet, it succumbs to the wrath of the ocean and sinks. It certainly create a rather theatrical sense of tragedy, and the island slowly chips away with you still on it. However, I also find that this means of creating drama can be a bit detrimental. Of course, all cooperative games are meant to be challenging, but as rows and columns of tiles can quickly become flooded, then the game will occasionally chuck a huge wall of despair at you by cutting everyone off and therefore causing a loss. It’s not due to poor design. Sometimes the luck of the draw simply chucks you into some rather unfortunate dead ends. In other co-op games, even when you’re in danger of falling into the void of failure, you still hold out all hope against defeat, spurring on in a bid to somehow reverse the odds. In a fair few games of Forbidden Island, the despair is just altogether too strong, as players can’t reach others in time to save them from doom. One of the biggest draws of physical copies of tabletop games in comparison to their digital counterparts is the satisfaction of holding components in your hands. The physical editions artifacts are wonderful to grasp hold of, especially after you’ve fought so hard for them. However, the digital version doesn’t exactly pale in comparison when it comes to aesthetics. The tiles retain their lovely Myst like artwork and those pesky treasures are wonderfully illustrated. Together with the slickness of animations and the fact that you’re not going to have to do any tidying up afterwards, it’s a rather minor sacrifice. I made it clear in my review for the physical copy of Forbidden Island that it’s a great cooperative game, but that there were alternatives I would rather spend my hard earned cash on. With the cooperative game pool growing ever greater in quantity and quality, I still stand by that comment. However, with a decent price point, user friendly tutorials and a commuter friendly nature, it’s certainly worth taking the plunge. 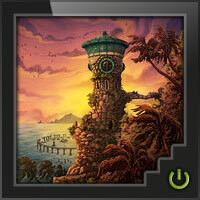 This game involves a team of players collecting relics on an island that is sinking. Collect cards, move around, “repair” parts of the sinking island, use your sandbags, use a helicopter to fly around, exchange relic cards with other gamers … all before the island slips away. As the game goes along, the island sinks more quickly. Card based game with movement around the island. A good game if you don’t want to get too involved with rules and long time commitment. Good for younger players too. May be a bit too easy for experienced players; if you get a bad run of “sinking cards”, you’re toast. But otherwise, it seems like you can win if there are no major ******** by your team of gamers. Generally a good good rating, except for replay (over and over again). If you’re doing a bunch of gaming, it might be a good “filler” game on the side, or to occupy a bit of time while another game finishes up. Add a Review for "Forbidden Island"